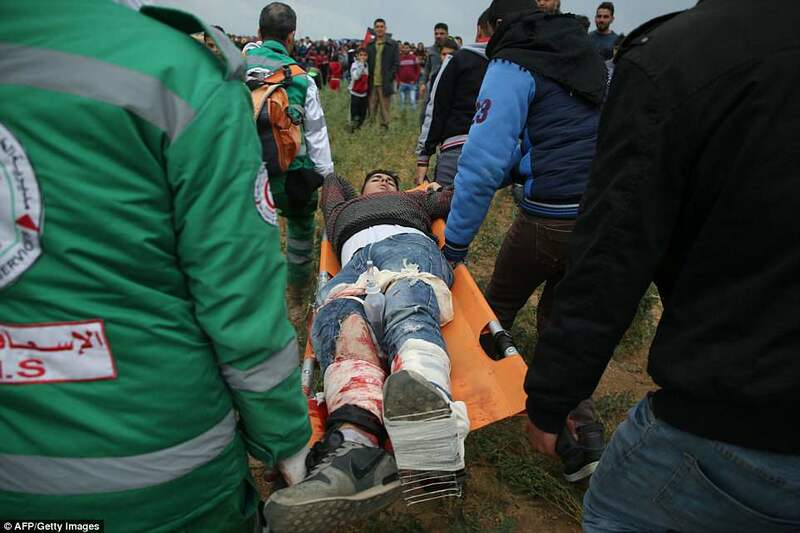 At least 17 Palestinians have been killed and 1,400 were left hurt during one of the largest Palestinian demonstrations along the Israel-Gaza border in recent years. 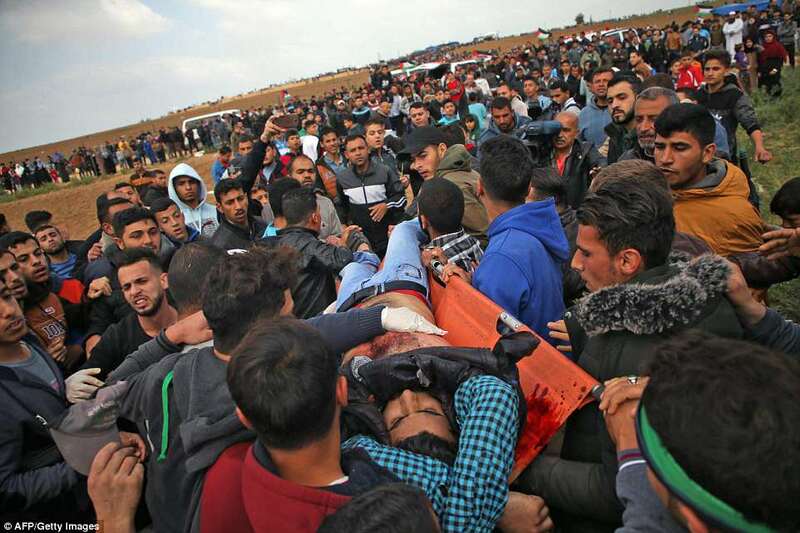 Gaza health officials said one of the 17 dead was aged 16 and at least 400 people were wounded by live gunfire, while others were struck by rubber bullets or treated for tear gas inhalation. 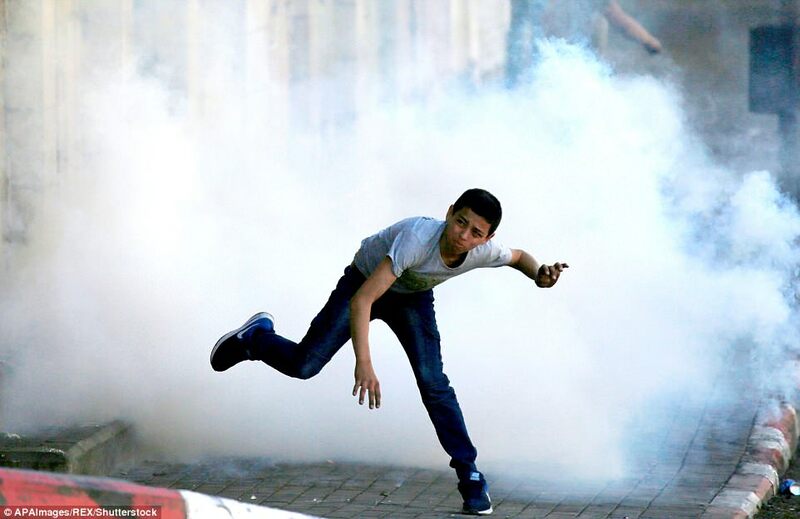 Protesters lit car tyres on fire and launched them at security forces while others picked up rocks and bottles and flung them at the troops. 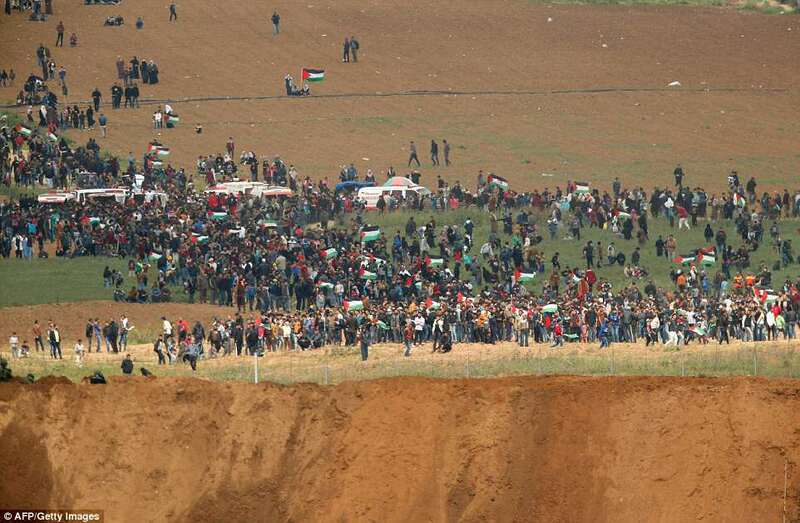 But as the day wore on, hundreds of Palestinian youths ignored calls from the organisers and the Israeli military to stay away from the frontier, where Israeli soldiers across the border kept watch from dirt mound embankments. The military said its troops had used ‘riot dispersal means and firing towards main instigators.’ Some of the demonstrators were ‘rolling burning tires and hurling stones’ at the border fence and at soldiers. 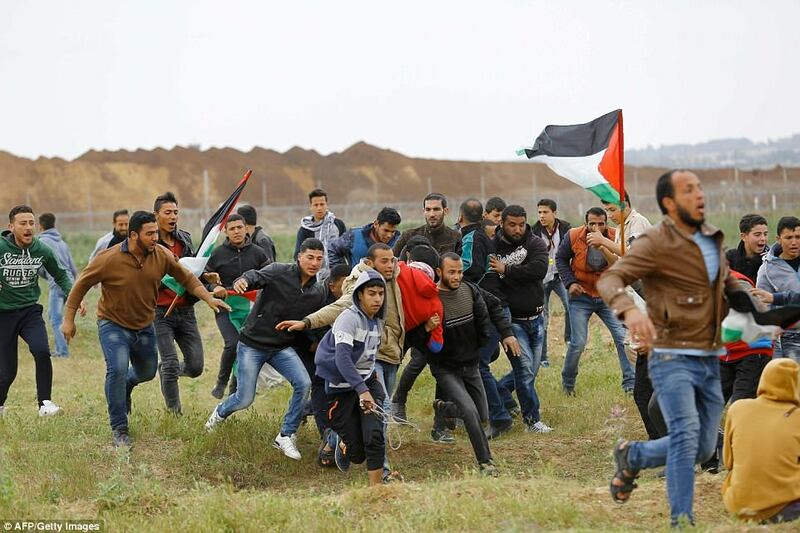 Israeli troops fired live bullets and tear gas at protesters on the other side of the border fence, and thousands of Palestinians were wounded by army fire, Gaza officials said. 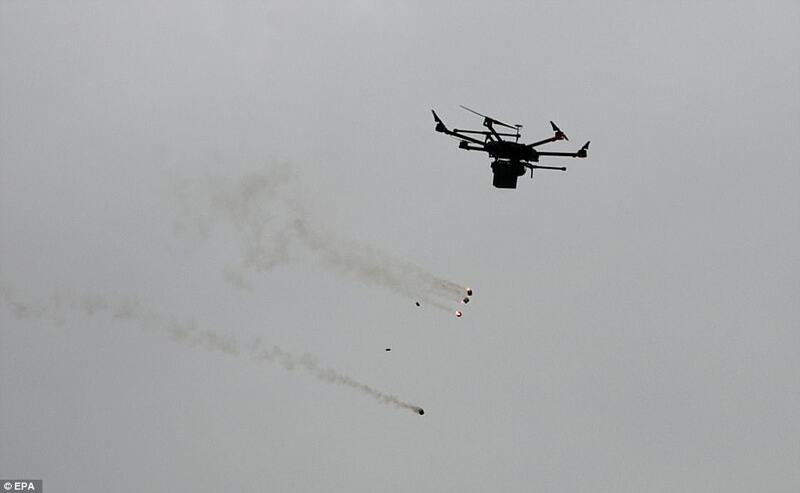 An Israeli drone dropping tear-gas grenades during clashes after protests along the border between Israel and Gaza Strip, in the eastern Beit Hanun town, in the northern Gaza Strip. 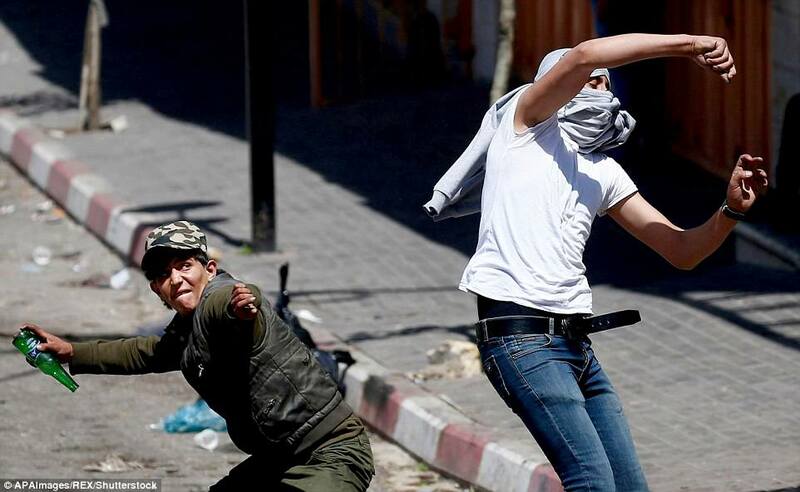 Twelve Palestinians were killed and more 500 others injured during the clashes along the border with Israel. The six-week protest has prompted the Israeli army to deploy reinforcements, including more than 100 special forces snipers, for fear of mass attempts to break through the security fence. 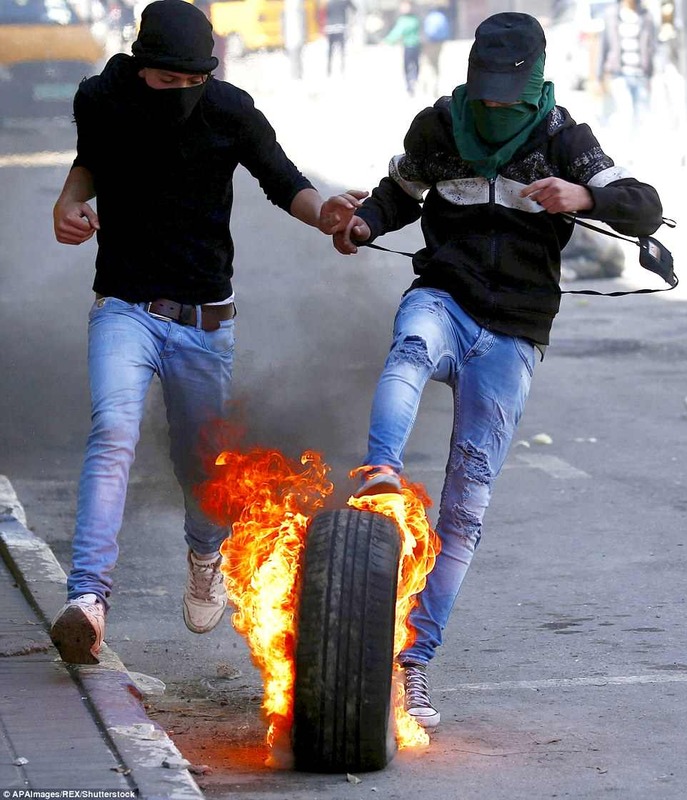 The Israeli military said thousands of Palestinians rolled burning tyres and threw stones at forces stationed on the border. It said troops opened fire at the ‘main instigators’. The military said it views with ‘great severity any breach of Israeli sovereignty or damage to the security fence’. Several hours before the confrontations, a 27-year-old Palestinian farmer was killed by Israeli shelling in Gaza as he was working on his land near the border. 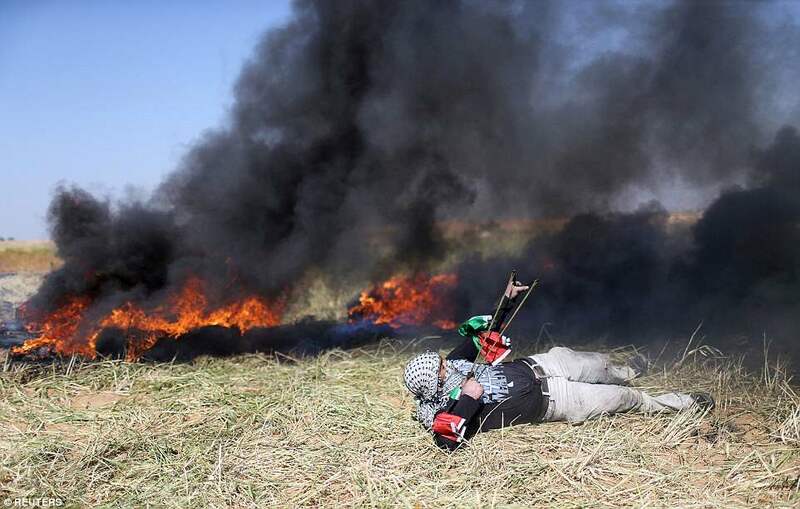 Thousands of people, including women and children, are expected to march to the camps in the coming weeks, in a series of protests named ‘The Great March of Return’. According to the United Nations, some 1.3million of Gaza’s 2million residents are refugees or their descendants and ‘The Great March of Return calls for them to be allowed to return to land that is now Israel. 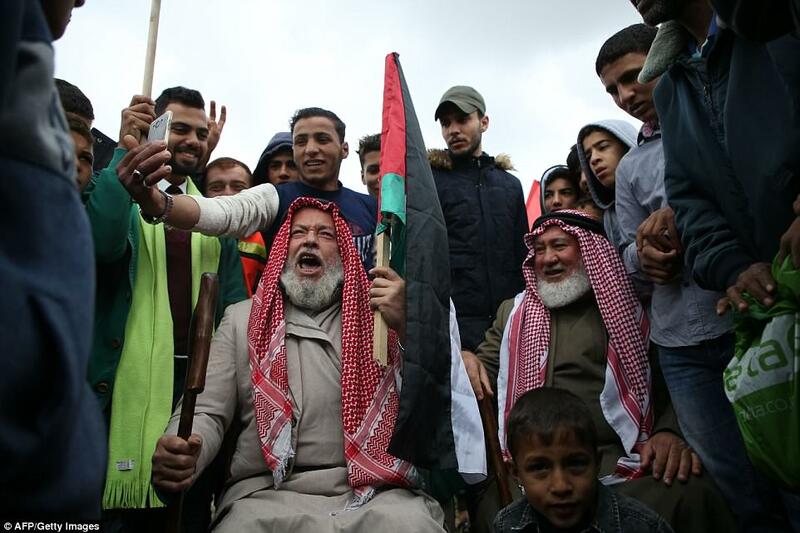 Hamas spokesman Fawzi Barhoum praised the turnout, saying: ‘The large crowds … reflect the Palestinian people’s determination to achieve the right of return and break the siege and no force can stop this right,’ he said. Among those taking part on Friday was Ismail Haniya, the leader of the Islamist movement Hamas that controls Gaza. ‘There is no alternative to Palestine and no solution except to return,’ he said in a statement, referring to Palestinian refugees seeking to go back to land they fled or were expelled from in 1948 that is now inside Israel. 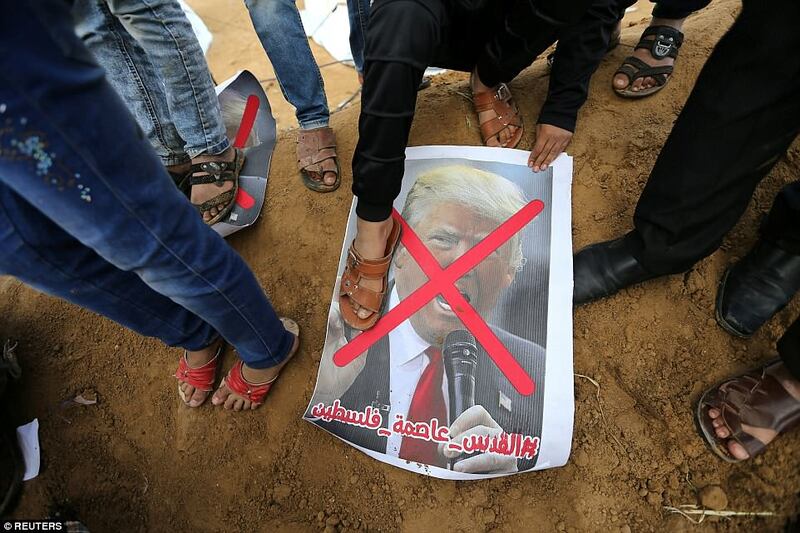 The protest camps are expected to remain in place for more than six weeks in the runup to the inauguration of the new US embassy in Jerusalem around May 14. US President Donald Trump’s recognition of the disputed city as Israel’s capital in December has infuriated Palestinians, who claim its annexed eastern sector as the capital of their future state. 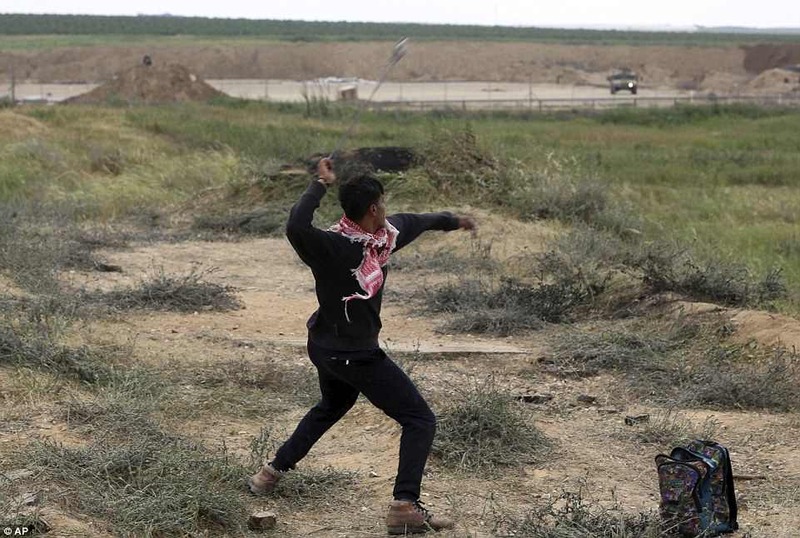 Hamas has fought three wars with Israel since 2008 and Israeli chief of staff Lieutenant General Gadi Eisenkot has warned the Gaza protests pose the most serious risk of renewed conflict since he took up his post in 2015. 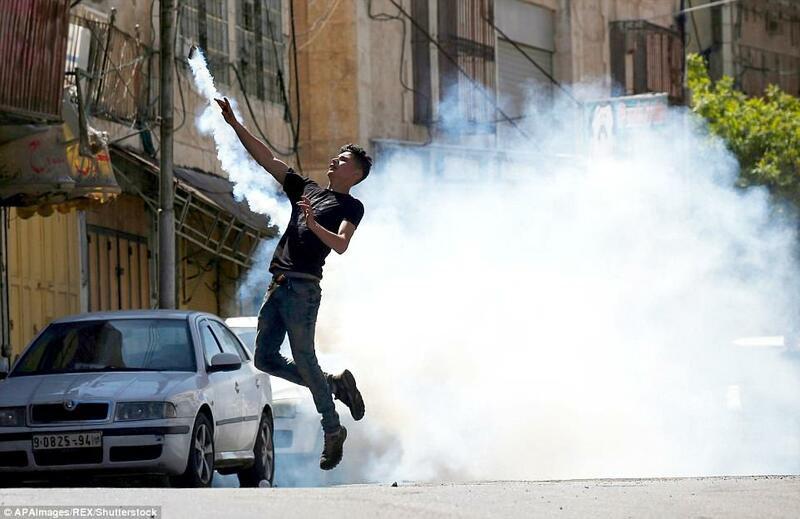 Protests along the border are common, often culminating in young Palestinian men throwing stones at Israeli soldiers who respond with tear gas, and rubber and live bullets. The March of Return protest is different because it involves hundreds of Palestinians, including whole families with women and children, camping along the border for weeks. 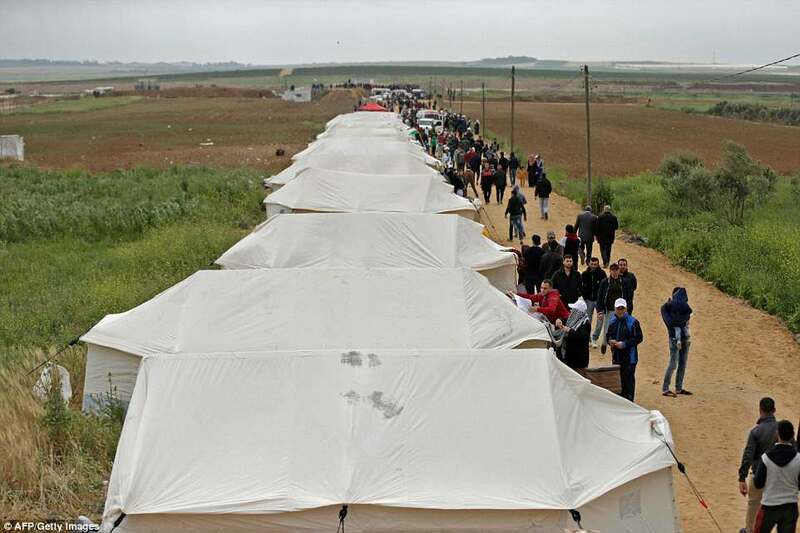 Five main camp sites have been set up spanning the length of the heavily fortified frontier, from near the Erez border crossing in the north to Rafah, where it meets the Egyptian border in the south. Cultural events are planned in the larger communal tents, including traditional Palestinian dabke dancing, while tens of thousands of meals will be handed out on Friday, organisers said. A young couple were married near one of the camps on Thursday evening. The launch of the protests comes as Palestinians mark Land Day, commemorating the killing of six unarmed Arab protesters in Israel in 1976. It is expected to begin on Friday morning but swell after the main weekly Muslim prayers at midday. 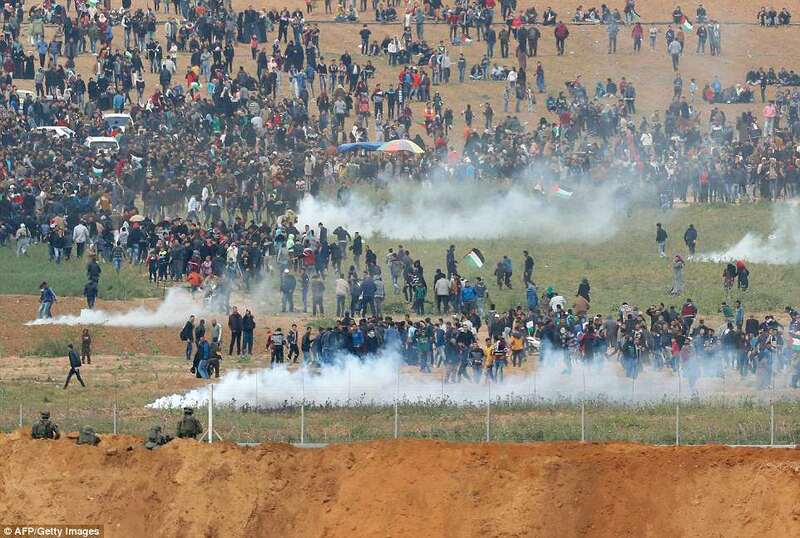 Organisers say the camps will remain in place until May 15 when Palestinians commemorate the Nakba, or ‘catastrophe’, when more than 700,000 Palestinians fled their land or were expelled during the war that led to the creation of Israel in 1948. Washington’s plans to launch its new embassy around the same time, to coincide with the 70th anniversary of the foundation of the Israeli state, have further stoked Palestinian anger. How Effective Is Thanos as a Villain in Avengers: Infinity War?